The pattern is posted HERE as a down loadable PDF file for you to print out. Instructions are also available to download HERE for you print out on your printer. Please note that it is necessary to click on those links (red colored "HERE") to go to another website in order to download the documents to your computer to print out the pattern and instructions. After printing out the pattern, I recommend that you trace the pieces for the bird's body onto freezer paper. Ironing the waxy side of the freezer paper pattern to the fabric will be easier to work with than just pinning it in place. I have used just the one pattern for all the birds I've made and it still sticks to fabric. To trace, use a light table or a window. I've placed a lamp under the acrylic extension for my sewing machine to create a light table. Lay the body piece over the fabric. 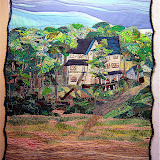 It helps to see your placement if there is light behind the fabric. Move the pattern around, be aware of how the eye of the bird is placed as well as the patterns along the back, tail, and breast (wings cover up the rest). You are figuring out just one side of the body at this point. Alicia and I have cut a number of bird parts from this particular fabric. See all the holes from where we found desired patterning? The design pattern placement is more important than grain lines. Secure the pattern in place with a couple of pins. Iron the wax paper pattern to the fabric and then cut it out. Determine the other side of the bird's body. Remove the paper pattern and lay the right side of cut out piece to right side of the fabric. Use a light source to match up patterning. Some fabrics make it easy by having reverse images. For others, like this one, you need to look for an area that almost repeats the patterns. Pin the cut out bird body piece to the desired area for the other half of the bird's body. Do NOT cut out the pattern shape. If the fabric piece is large, cut it well beyond the pattern lines. Take the layered pieces to the machine and stitch the top seam between the beak and tail. Be sure to leave seam allowances at the beginning and end of that seam. Cut out the other half of the bird using the already cut out bird as a pattern. Trim the top side seam with pinking shears OR clip all those curves with regular scissors. Cut out the stomach pieces. Use a light source to select appropriate patterning for the breast and end of the tail. Open the bird and pin the breast pieces to the bottom seam of the bird's body. The shorter one goes to the beak end. Note that the seam allowances are turned where the two pieces meet. Stitch this seam leaving seam allowances at each end. Pin the bird body to the other side of the breast pieces and stitch. Clip the curves in the seams with scissors. Trim the points off the beak and tail ends. Turn the body right side out, being sure the beak and tail are fully turned. Stuff the ends with fiber fill leaving a hollow at the opening for the legs to fit into. The material for the legs of the large birds that I found is wrapped florist wire. It is fairly stiff and requires wire cutters. Cut an 18" length plus two 3" lengths. Bend the long one in half with a gentle curve that is the width of the birds body. Insert the bend of the long wire into the hollow cavity. Continue stuffing the body until you are satisfied with its fullness. Making sure the legs piece is pushed up into the body secure the wire to the opening of the seam with a stitch or two through the wrapping around the wire. Take a stitch through the fabric to get to the other side of the wire. Take another stitch through the wrapping on the wire at the inside of the leg. These stitches secure the wire so the bird will be stable when it stands. Use the ladder stitch to close the seam. Alternate running stitches in the folded edges of each side. Take a few stitches before pulling the seam shut. This stitch was created for closing the last seam on stuffed bodies of toys. Secure the body to the other leg with a few stitches through the wrapping on the wire. Run the thread through the stuffing to exit about 1" above the seam in the wing area. Make three stitches that catch the wire. Knot off and secure the wire at the same level on the other side. This stitching will ensure that your bird is stable when it stands. Cut the wings out. Choose a fabric for the underside of the wings. Layer the cutout wings and that fabric right sides together. Place a layer of batting under the wings. Pin the layers together and stitch completely around each wing. Cut out the wings with pinking shears. If you use regular scissors, clip all the curves. Cut a slit through the batting and lining (back side of wing) for turning it right side out. It is easiest to use tweezers, especially the kind that locks shut. Insert the tweezer and grasp the pointed end of the wing. Gently work it toward and out of the slit. Grasp the fat rounded end and pull it through the slit. Gently steam press the wings being sure not to flatten them. Machine (or hand) quilt feather-like patterns or follow the printed design in the wings. I was so anxious to take photos of the process for this bird that I forgot to quilt his wings. I think they look just fine, so quilting is optional. Attach the wings to the body. I play with positions by pinning them on and assessing how they look for that particular bird. Each one develops a personality as it's constructed. Use tacking stitches in the approximate locations of the x's marked on the pattern pieces. Now, for the face. Use a fine thread to slightly indent the eye sockets on each side. Sew beads in the sockets. Anchor them on several sides so the holes stay centered. Alicia and I used a lightly felted wool used for rug hooking to fashion the birds beaks. Any slightly heavy fabric could be used. If you look closely at the flock, you'll see a variety of beak styles. We found this one to be most realistic and easy to do. Cut one piece of each pattern. Both pieces will be pinned into position before they are adhered with glue. Pin the bottom beak in place. Begin with the center. Pull the beak ends "into a smile" and pin. Pin the top beak in place. Begin with the center, then pin the sides. It may be necessary to trim one of the beaks so they meet. That is unless you find an under or over bite appealing. Now, it's time to glue. I use a basting glue made for applique in quilting that has a wonderful applicator on the squeeze bottle. Any fabric glue could be used and applied with a pin. Loosen the pins (do not remove) of the lower beak and apply dots of glue on the bird fabric under the beak. Push the pins back in place until the glue is dry. Repeat with the top beak. Open the end of the beak and apply a few drops of glue near the end of one beak. Lightly pinch the beaks together. This gluing will stabilize the shape of the beak. Now, how tall will your bird be? Determine its height and bend the leg wires forward at a 90 degree angle. Bend the two short pieces in half to make the front toes. Place the toe piece on top of the bent leg piece. Wrap the leg extension piece to the back and then around one more time. The front toes should not wiggle. If they do, give the "knot" a pinch with pliers. It's fun finding each bird's balancing point. Experiment with leg positions, including adding a bend. We found that the shorter the legs the more easily the birds stood. No two out of 23 birds have the same posture. PS: Eventually, I gave up making the birds stand on just their feet alone. I began glue their toes to pieces of driftwood, stones, or shells. The little birds are made from a 75% reduction of the same pattern. I know this can be done on a copy machine ... don't know if it can be reduced in the printing process from the PDF file. Note that the seam allowance is also reduced. Their legs use the full length of a big sized craft pipe cleaner. They will stand precariously on those little circle or feet made like the big ones. My intent for them is to perch on branches. PS: The original idea is from Terry Grant's blog. I felt the same way when I saw her birds as a lot of you are feeling when you look at mine and Alicia's. 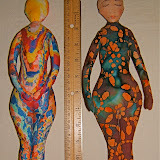 Pop on over to her blog and scroll down to her March 30th and January 6th posts to be further inspired by her birds. I find the differences in our choices of fabric interesting. Are her choices more subdued because of the time of year she made them? and where she lives? while we made ours during the full flowering of spring? "Great birds! I'm glad you took the idea and ran with it. I just have not had the time to get a pattern put together for my birds. Similar, but some differences. And the fabric choices? Ah, I think fabric choice and color choices are very personal. 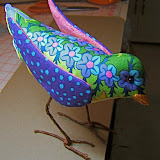 I made my birds from fabrics I love, which tend to be subdued. I love your bright Springtime birds." PPS: WOW! There's been a lot of interest in these birds. Someone posted about them on public forum sites in Germany and France. I welcome all who have come here to read about them and have gone on to download the pattern and instructions to make their own. I would very much like to see any that are made. If they are posted on a blog, please email me or comment here where they can be seen ... or email a photo to me. I shared mine, now please share yours. All collages available for a minimum donation of $80. All collages available for a minimum donation of $40. Viewing of the 235 donated art pieces from over a hundred artist world wide to raise funds for the American Cancer Society begins today. There are 21 pages of remarkable work to be seen here. I recognize many of the donor artists names from blogs I read. My donation is on page 14. I wrote about it here. 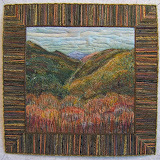 Thanks to the generosity of the donating artists, 100% of the proceeds are donated directly to the American Cancer Society through Fiberart For A Cause. For all the details on how to participate in Collage Mania, click here. Collage Mania will remain indefinitely on Virginia A. Spiegel's website as a resource for collage artists. Alicia made these last two birds since the flock gathered at the bird bath fountain. ... and I made this pair. The little birds are made to be Christmas ornaments. Glitter glue adds sparkle to mine. Their legs are made of craft pipe cleaners so they can be wrapped around a branch to sit upright in a tree. The pattern will be posted soon so you, too, can have fun. Our 28th SMQ guild show will be May 16th through the 18th. Click your mouse on the poster to enlarge it for easier reading. My contribution is making the special award ribbons as I did for last year's show. 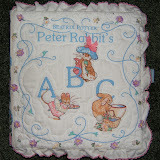 Here are the tops for the "Best In Show" bed and wall quilts. At some point I'll post a detailed tutorial on their construction, as well as photos of all of them completed. 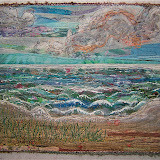 I have two entries in this judged show, "Come With Me to the Kasbah" and a large lake piece. Photos of them will be posted after the show is hung. 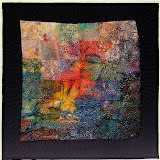 To view some of the quilts in last year's show that I blogged about go here. 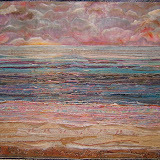 To see the award winning quilts for all the shows going back to 2005 go to SMQ Guild's website. Those of you reading this who live within driving distance and come to the show, please email me (address on my profile page). I'll be there for a period of time every day and would be happy to meet you and give you a personal tour of the show. Thought you may like to see the flock as it grew. The two birds in the foreground of each frame are the newest additions ... one of Alicia's and one of mine. Enjoy! Then they all flew away (half of them to Milwaukee) leaving the fountain to the metal sculpture bird who usually occupies it. Real birds come to visit him for a drink and occasionally to bathe. Alicia and I have been really busy making these birds besides going shopping, to the Allison Krauss/Robert Plant concert, a trip to the mountains and another dinner party. Tomorrow is her last day here. Soon I'll post a tutorial and pictures so you can see all of these birds ... plus the ones that will be made before she leaves. My friend, Alicia, is visiting for ten days and we're busy making birds. We've made enough so far to have a flock as the center piece for a small dinner party tonight. I'll be back to tell and show more after she leaves next Friday. We're off to picnic on a stream in the mountains tomorrow. She and I always find a lot to keep ourselves busy and "on the go". 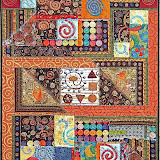 Those of you who have taken Ricky Tims' Quilting Caveman Style class know that if one "Chantelle" tulip is made, there's the makings of another with the "negative" cut away pieces. Here's my second one. This quilt was gifted to a friend for Christmas. He, my husband, and I had planted a "load" of tulips at our condo entrance that previous spring which made this a most fitting present for him. We had dug deep into the clay and conditioned the soil with "good stuff". I'm sorry to say critters have since dug up and feasted on all but a few bulbs. However, the daffodils we set at that time have multiplied and filled in to make a nice show. 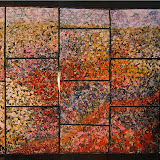 Both tulip quilts have the "dancing square" technique in their borders that Ricky presents. What a difference the combinations of fabric make in the visual effect. Many years ago I had planted a dozen tulip bulbs to have an early bright spot of color. Then our dog, McV, decided that was his spot to lay when he was outside. For the past several years only a single tulip has blossomed and we consider it a memorial to him. In the spring of 2001 my husband and two shelties, McV who was eleven years old and Basil who was seven, were left at home while I spent a week in Pigeon Forge taking every class that Libby Lehman and Ricky Tims taught at that quilt conference. 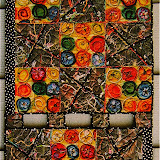 The day that McV became paralyzed and ended up being put to sleep, I had constructed this quilt. I cannot look at this piece without thinking of McV. Initially it was with sadness, but now it's remembering his long-legged prancing and howling. He's our only sheltie who ever howled ... and that was when he was prodded by our asking if he wanted to "go to the beeeaaach". That quilt hangs at the cottage. All of our past pets are represented by metal sculptures in our patio garden. Our first "child," Dudley the dachshund was with us for sixteen years. Tamar, our first sheltie, was the dog of our sons growing up years. As was our only cat, Smudge. Two shelties, Basil who is fourteen years old and Presley who's three, are the animal members of our family. The old guy is deaf, but still frisky and she is the smallest and the most spoiled ... the only one ever allowed on the furniture. She even has her own quilt ... to protect the cushions.